At least 10 people were killed in explosion in a train carriage at metro station in St. Petersburg on Monday, according to Russian authorities, the same day Russian President Vladimir Putin visits the city. 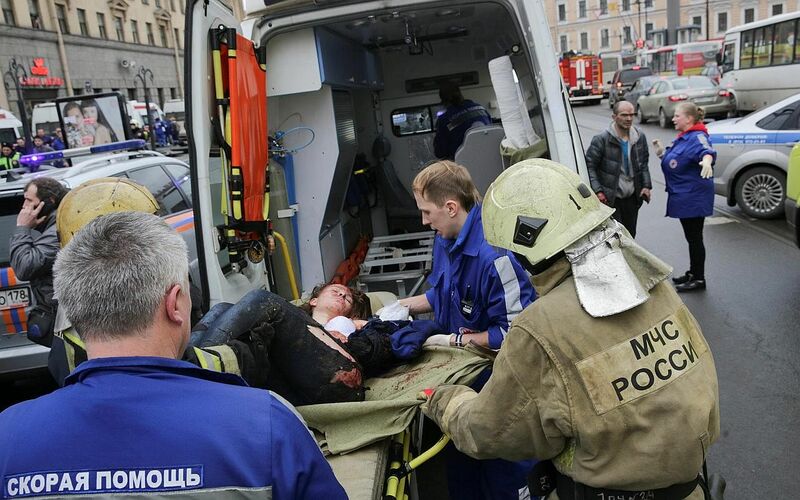 MOSCOW - At least 11 people were killed and more than 40 injured when an explosion tore through a train carriage in the St Petersburg underground system on Monday (April 3), the Russian National Anti-Terrorist Committee said. 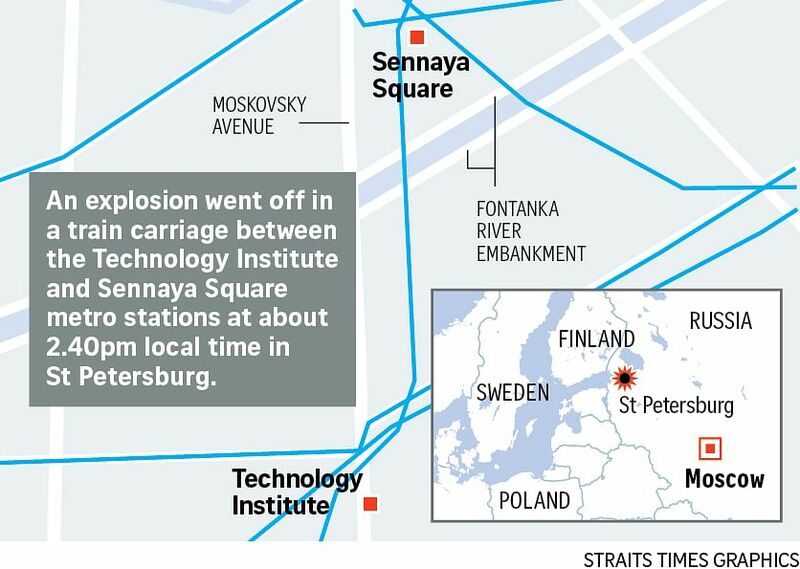 "Today, around 14:40 Moscow time (11:40 GMT), an unidentified device exploded in a tunnel between Tekhnologichesky Institut and Sennaya Ploshchad stations of the St Petersburg metro. The blast caused casualties and fatalities," a source from the committee told TASS news agency. 11.40 GMT is 7.40pm Singapore time. The bomb appeared to have been left in the train, not detonated by a suicide bomber, Interfax reported. There were conflicting reports on the number of dead and injured initially. The Russian National Anti-Terrorist Committee had said nine people died and 20 people sustained injuries at first. Russia's health minister Veronika Skvortsova said 10 people were killed and 47 were injured. Media websites showed pictures of blown-out train doors at Sennaya Ploshchad metro station, and injured people on the station platform. A student identified only as Polina who was on the train between Sennaya and Tekhnologichesky Institut stations told Gazeta.ru, a Russian news website: "We were riding in the neighbouring car, and at that time it was very crowded: all the seats were taken and many were standing. "The explosion went off between stations. There was a thundering clap, followed by a strong smell and smoke." She said the train was still moving even after the blast. "Everyone got out at Tekhnologichesky Institut station. There, we saw that the neighbouring wagon was shattered, the windows blown out, no light, blood." St Petersburg resident Leonid Chaika, who said he was at the station where the blast happened, told Reuters by phone: “I saw a lot of smoke, a crowd making its way to the escalators, people with blood and other people’s insides on their clothes, bloody faces. Many were crying." The explosive device was said to have been filled with shrapnel, Interfax news agency said. The home made device was thought to be equivalent to 200 grams of TNT. Surveillance cameras in St Petersburg’s metro system may have captured images of the person responsible for the blast, Interfax quoted a source as saying. “Images of the suspected organiser of the metro blast were captured on metro station cameras,” the source said. The explosive device may have been left in a briefcase in a train carriage, the source added. Another improvised explosive device was found and disabled at Ploshchad Vosstaniya station in the city. It was also stuffed with shrapnel, the state security agency said. All metro stations in St Petersburg - Russia's second-largest city - have been closed. Security measures have also been enhanced at St Petersburg’s airport Pulkovo following the explosion at the city metro, the airport’s press service told TASS. "The airport has tightened security measures, including security control at the airport’s entrances and pre-flight inspections." The Moscow metro said it also was taking unspecified additional security measures in case of an attack there. It comes as Russian President Vladimir Putin is in St Petersburg holding a meeting with the President of Belarus Alexander Lukashenko. Mr Putin said they were trying to establish the cause of the blast. “I have already spoken to the head of our special services, they are working to ascertain the cause (of the blasts),” Mr Putin said. “The causes are not clear, it’s too early. We will look at all possible causes, terrorism as well as common crime,” he added. The President also expressed his condolences to the victims. Russian Federation Council Defense and Security Committee Chairman Viktor Ozerov said the blast has every sign of a terror attack. Mr Alexander Kurennoi, a spokesman for the prosecutor-general, also described the blast as a terrorist act. He told Russia's international state broadcaster RT: "Soon we and our colleagues from the law-enforcement agencies will start work on minimising the impact of this terrorist act, as well on establishing all the circumstances that contributed to it being carried out." Russia has been the target of attacks by Chechen militants in past years. Chechen rebel leaders have frequently threatened further attacks. At least 38 people were killed in 2010 when two female suicide bombers detonated bombs on packed Moscow metro trains. Over 330 people, half of them children, were killed in 2004 when police stormed a school in southern Russia after a hostage taking by Islamist militants. In 2002, 120 hostages were killed when police stormed a Moscow theatre to end another hostage taking. Mr Putin, as prime minister, launched a 1999 campaign to crush a separatist government in the Muslim southern region of Chechnya, and as president continued a hard line in suppressing rebellion. An attack on St Petersburg, Russia’s old imperial capital, would have some symbolic force for any militant group. Attacks in the past have largely concentrated on Moscow. Prime Minister Dmitry Medvedev also expressed his condolences to the victims and told officials to provide aid to all those affected. A three-day period of mourning was declared in St Petersburg starting on Tuesday.